You are invited to join us for the 26th annual Association of Trained Intentional Interim Ministers (ATiiM). Our theme for this conference is: Bringing Justice: Immigration & Civil Rights. This year Rev. Dr. Damayanthi Niles and Rev. Dr. Traci Blackmon join us as our keynote speakers. They will share information and their insights on the helpful ways in which clergy live out the biblical call for Justice action and help congregations and their members grow in living out that biblical call, including being sensitive to those who are struggling with and/or resisting the biblical call to Justice. We will also have two times of Conversation to reflect on this important need in the future of local church ministry. 9:00 p.m. Adjourn, snacks You are invited to bring snacks to share! Click on “Parks & Recreation” for directions. Rev. 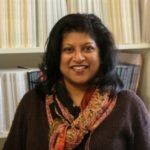 Dr. Damayanthi Niles is a professor for Constructive Theology at Eden Theological Seminary. She has studied and lived in several countries. She has served as the research associate of the Christianity in Asia Project at the Centre for Advanced Religious and Theological Studies at Cambridge University, United Kingdom. Rev. Dr. Traci Blackmon, Acting Executive of the United Church of Christ Office of Justice and Witness ministries and Pastor of Christ the King United Church of Christ in Florissant, MO. She is the nominee for election to the position of Executive for Justice and Witness Ministries at UCC General Synod in July, 2017. Please note: Starved Rock Lodge will hold rooms until September 1, 2017. Please make your own room reservations at Starved Rock Lodge – (800) 868-7625. Indicate you wish to reserve a room in the ATiiM block. Senior Discount (10%) is available if you ask when you reserve or check in. If you wish to share a room at Starved Rock, email Dave Kniker at [email protected] or contact by telephone at (309) 853-7814. He will assist in coordinating such requests. Go to www.ilucc.org or www.cciwdisciples.org and register online. Confirmation will provide details for online payment with credit/debit card. Clergy: $150.00 (early registration fee of $135.00 before September 15, 2017). Fee includes materials, break, Wednesday dinner, and Thursday lunch. See the Housing Information provided if you plan to stay Wednesday night. Extra meal costs for guest/spouse: Dinner Wed – $22.00; Lunch Wed – $16.00. ATiiM Dues: Dues are $25.00 per calendar year. If the 2018 dues are paid with your registration for this event, you can choose a book from selected books in the Conference Bookstore. Starved Rock: The Lodge offers excellent dining, pool, whirlpool and other amenities. Illinois Waterway Museum, as well as a guided hike may be available for a small fee. Please indicate your interest on the registration form. Upon receipt of your registration an e-mail confirmation will be sent. See web information-next panel. Come early and enjoy !